Ant-Man should be Ant-Woman: Scientists suggest a better superhero for Marvel’s movie. Ant-Man would be much more awesome if based on actual ants. He’s no Captain America, but Ant-Man has a few things going for him. Like Iron Man, the superhero in Marvel’s forthcoming Ant-Man movie uses a super-powered suit. 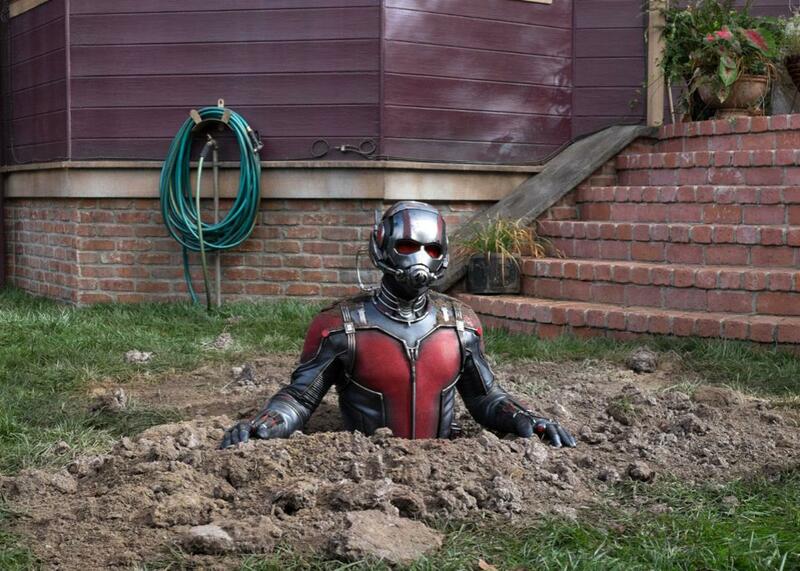 And Ant-Man’s suit lets him shrink to half an inch in height—while growing in strength! He has a special helmet that lets him telepathically control ants! And he uses these superpowers to fight his nemesis, Yellowjacket! Yeah. Something’s missing. I suspect that when Ant-Man sits down for his performance review with the Avengers, he squeaks by with a “meets expectations,” while Captain America gets a giant bonus. So to help the Avengers, I reached out to three scientists to help design an awesome Ant-Man inspired by real ants. Good to know: We don’t want a useless, dying superhero. But will Ant-Woman have Ant-Man’s super strength? Ants can lift things much larger than themselves. But the idea of shrinking and becoming overwhelmingly strong is “preposterous,” says Larabee. “Ants are very small and can lift a huge amount of weight relative to their body size”—but not so much that an ant-sized superhero could beat up a human. So no—Ant-Woman can’t have real super strength. Not that she’s defenseless. Inspired by the mighty trap-jaw ants, Ant-Woman will have deadly spring-loaded jaws that she’ll use “to smash things,” says Larabee. Plus, she’ll have an amazing escape jump. Like trap-jaw ants escaping from ant-lion pits, she’ll snap her spring-loaded jaws against the ground and fling herself backward through the air to escape her nemesis. And while she’s flying backward, Ant-Woman won’t worry about losing the helmet that lets her talk with ants. Ant-Woman will secrete communication chemicals that her ant allies can smell with their antennae. To work with her super friends, Ant-Woman is going to coat herself in a “complicated chemical fingerprint,” which ants use to tell nest mates from outsider ants, says Larabee. But there’s more to ant communication than chemical ID cards: Ants can secrete alarm signals, use their stingers like paintbrushes to lay chemical trails, and even—if the ant is a queen—emit a chemical that keeps workers sterile. Like all interesting superheroes, Ant-Woman has a dark side. By hijacking ant communication systems, she’ll be what Adams calls a “social parasite.” Ant species that are social parasites mimic the chemical fingerprints of other species to sneak into the colonies of these other species. Despite her noble goals, Ant-Woman will be a social parasite like slave-making ants—workerless parasites that invade other species’ colonies, steal their broods, and raise the kidnapped ants to work for the slave-makers. Ant-Woman might even attract the CIA’s attention: Social parasites use many nefarious weapons, from sedatives to toxins to propaganda substances, which can make other types of ants attack one another. Not that Ant-Woman will watch her victims go mad. Like Daredevil, she’ll be blind. Because many ants live underground in the dark, says Adams, most can’t see, and “some species don’t have eyes at all.” Like ants, Ant-Woman will sense her environment through the chemicals in it. And with her chemical wizardry, Ant-Woman will be able to have an alter ego, like Spider-Man’s Peter Parker. “She would be a chemist by day and a superhero by night,” says Adams, “because ants are chemical factories” with dozens of glands that produce chemicals. Like ants, Ant-Woman’s chemist identity will make antimicrobials to ward off infections—making her super valuable to the Avengers, who like to pick fights and who get lots of cuts and scrapes that can get infected. But speaking of fights, how would Ant-Woman’s spring-loaded jaws and chemical weapons fare against Yellowjacket? Ant-Woman wouldn’t fight him in the first place. While some ant species—like army ants—are aggressive, most are not. “Very few go out and pick a fight,” says biologist Deborah Gordon of Stanford University. And Yellowjacket might not start a fight, either. “I don’t know of any yellow jackets that attack ants,” says Larabee. Indeed, Ant-Woman won’t have time to fight—she’ll be keeping the peace among the 13,000 known ant species. “The biggest danger to ants,” says Larabee, “is other ants.” Ant-Woman will need to negotiate a truce with the terrifying army ants, which tear through forests consuming insects, other ants’ broods, and even birds. Then, she’ll have to untangle the complex net of ant social parasitism. Sometimes parasites can become allies, aka “guest ants.” When raider ants invade a fungal-farmer ant colony infected with social parasites, the parasites defend their hosts—meaning, Adams says, that “it pays for the fungus farmers to keep these guest ants around.” Which will make it tough for Ant-Woman to persuade the raiders, parasites, and fungal-farmers to work together. But I’m confident that it would pay for the Avengers to keep Ant-Woman around. With her spring-loaded jaws, chemical wizardry, and powers of social parasitism, she would “exceed expectations” on her annual review.